An introduction to the embodied ethics series can be found at this link. Gabriela Cowperthwaite‘s documentary Blackfish casts a light on the plight of captive killer whales in North American marine parks. The spine of the film is a series of interviews with former trainers, whale hunters, and scientists. One of the most stirring features of the interviews is the intense emotion expressed by individuals who have interacted with orca. 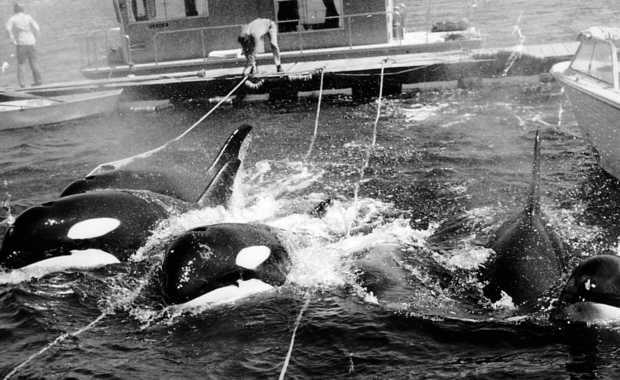 In an early sequence in the film, a sailor named John Crowe recounts being part of a team that captured some of the original whales taken for SeaWorld. He describes how, as a young “sea cowboy,” he found himself suddenly overwhelmed by a wave of emotion as he was culling the orca young at the end of a successful capture expedition in Puget Sound. We’re there, trying to get the young orca into the stretcher, and the whole famn damily is out here, 25 yards away, maybe, in a big line and they’re… communicating back and forth. Well… you understand then what you’re doing, you know? I lost it. I mean… I just started crying. I didn’t stop working, but I… you know, I just couldn’t handle it. Just like kidnapping a little kid away from their mother. Everybody’s watching. What can you do? It’s the worst thing I can think of, you know? I can’t think of anything worse than that. Crowe’s breakdown exposes two problems latent within contemporary conversations about ethics—especially in our ethical relationships and lapses with other animals. First, there is an ambient sense that nonhuman bodies are phenomenologically, emotionally, or psychologically empty and uncomplicated—bags of flesh that do nothing but “survive and reproduce,” as Richard Dawkins has said. (Unweaving the Rainbow, 211) There is an echo here of what might be called a behaviorist sensibility: for behaviorist psychologists of the early and mid-twentieth century, the only possible data for understanding animal (and human) experience were behavioral outputs rather than interior psychological states. As contemporary philosopher Lisa Guenther writes in her book on solitary confinement, “[f]or a behaviorist psychologist, it makes no sense to take the perspective of the experimental subject into account.” (Guenther, 102) This is partly why, for instance, animals (or humans) placed in small, confined spaces are not recognized as experiencing profound suffering. Because their behavioral output is neutral (sitting still), there is no need to presume that they are experiencing pain or distress—or anything at all. But as Crowe’s testimony suggests, the orca are put through profound grief and fear through the process of separation. Like us, they live in richly textured experiential worlds that are profoundly damaged by disruptions in their relationships with other bodies. His testimony points out the urgency of abandoning the anthropocentric, behaviorist approach that sees animals as unfeeling stimulus-response machines. We must open the possibility that ethical responsivity on the part of non-human animals emerges out of affectively saturated inner worlds. But in the mid-20th century, behaviorism was put under pressure as animals in experimental contexts were documented reverting from trained behaviors to instinctive ones, as described in Keller and Marian Breland’s seminal 1961 article, “The Misbehavior of Organisms.” (cf. Jaak Panksepp, Affective Neuroscience, Ch. 1) This turning point marked the beginning of an incomplete and ongoing shift, in Anglo-American science, back to Darwinian perspectives that view animals as having complex emotional lives—including, as more recent work has confirmed, rich capacities for ethical interaction. For animals and humans, ethics need not be viewed as simply a trained or conditioned response. There may be elements in our bodies that offer themselves as the raw material of ethical relationships. This is why Crowe’s account is so heartbreaking and so startling: he describes stumbling over a compassionate response that he wasn’t expecting—something he didn’t know he had in him. In an age when animals were viewed as living clockwork, he nonetheless found himself responding with grief and pain to animal suffering—and still finding himself affected 40 years later. His ethical response was not trained, nor was it intelligible to him on the surface. His “identity” as a macho, ex-military, maritime adventurer didn’t leave room for responding to animal bodies. Instead, a buried set of embodied values misbehaved. A set of ethical coordinates emerged from his body that were neither socially constructed nor trained—or at least not in a way that was intelligible to him as a knowing subject. Seeing ethics as only and originarily trained, conditioned, or constructed, then, makes two mistakes at once: on the one hand, it obscures the ways animal bodies experience deep emotional responses to other bodies—often recognizable as ethical responses—produced outside the regimes of language. Furthermore, it blurs our understanding of our own bodies—and especially the ethical prerogatives that emerge within our bodies and are coassembled, reconfigured, and buried by cultural parameters—sometimes successfully, but always with the lingering threat of rebellion. This entry was posted in Donovan Schaefer, Religion and Society and tagged blackfish, compassion, embodied ethics, evolution, Gabriela Cowperthwaite, lisa guenther, orca, Richard Dawkins, SeaWorld. Bookmark the permalink.